No doubt you will have seen press articles regarding the advantages of solar power and how Oman is rising to the challenge of meeting its target of obtaining 10% of its energy requirements by the year 2025 from renewable resources such as solar and wind power. If you are a company who uses over 150 Megawatt hours of electricity per year, you will also have noticed a steep increase in your monthly electricity bills since January 2017 as the Cost Reflective Tariff was introduced which removed government subsidies. How can I use solar power to reduce my monthly electricity costs? Symtech Solar MENA is a Muscat-based International company who designs and installs solar power systems for domestic, commercial and industrial clients. We take care of all permitting requirements and remove the obstacles to going solar. Who can benefit from reduced monthly electricity costs? Everyone can. If you own a property with a flat roof, you can install solar. If you have offices with a flat roof or land available for solar panels, you can install solar. You can install solar panels above car parking shades. If you are a manufacturer, you can install solar on your rooftop, on your car parking shades or on available land adjacent to your operations. Everyone in Oman can be part of the transformation to solar power. Installation of solar is quick, easy and problem free with Symtech Solar MENA. How do I pay for my solar panels? Symtech Solar MENA offers a number of innovative payment options for clients. The project cost is borne by the client with the client benefitting from free electricity for approximately 15-18 years. The output of the system is guaranteed for 25 years. The client provides the space for the solar installation and has minimum upfront investment. Symtech Solar partners with a bank or financial institution to provide project finance. The client makes monthly installments based upon an agreement with the bank/financial institution. Symtech is not the lender and only the third-party lender may approve, offer, or make a loan. For commercial and industrial projects over 10 Megawatts, we offer a Power Purchase Agreement where the client only pays for the electricity consumed with no upfront investment. Your monthly bills for electricity generated from your solar installation are significantly lower than your current bills from your electricity provider. The answer depends on the number of solar panels you install. When you request a custom quote, our team evaluates your energy usage patterns as well as sunlight and climate data for your region. The initial cost of going solar also depends on whether you buy or lease solar panels. Buying solar panels is more expensive upfront compared to leasing, but maximizes the long-term financial benefits of going solar. 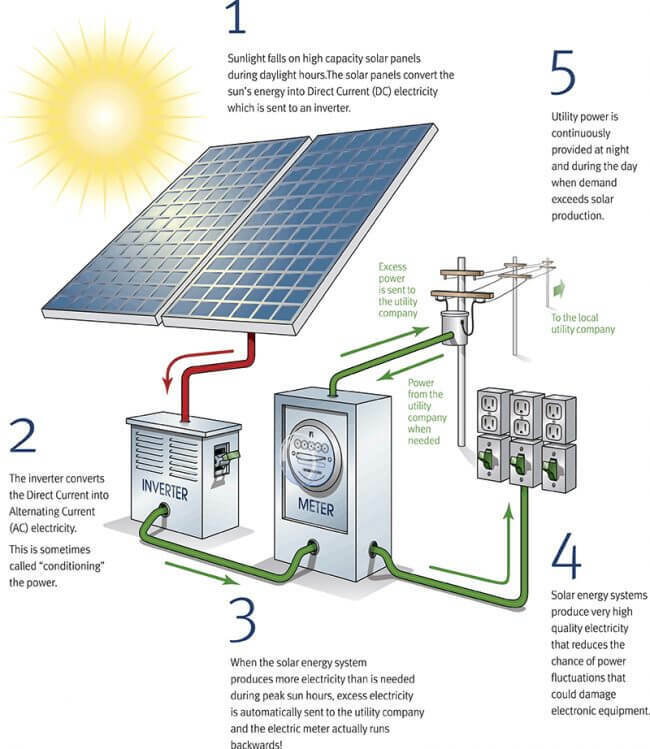 Buying an average-size solar panel system generally costs around 2.00 USD per watt, therefore, a 3kw system will cost approximately 6,000 USD (including installation) Leasing a solar panel system is $0-down and has fixed monthly payments. Whether you buy or lease, the solar energy you produce will lower your utility bill. Price and savings vary based on your location No security deposit required. 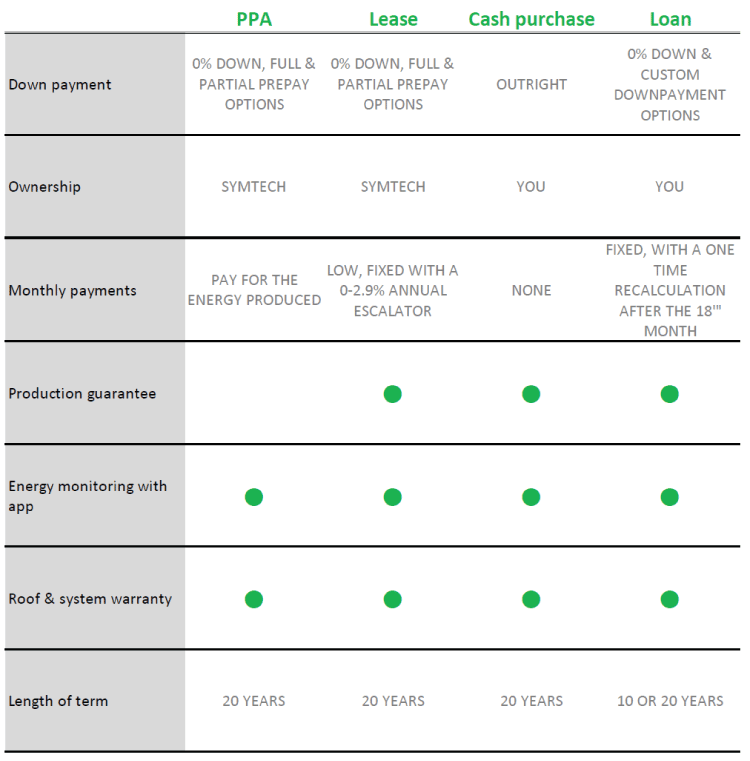 Symtech Solar is not the lender and only the third-party lender may approve, offer, or make a loan. Cash Purchase your system outright and own your energy from day one. Loan Similar to a car loan, you can finance your solar purchase through Symtech Solar and pay in monthly installments. You’ll immediately benefit from savings on your utility bill. Lease With a lease, you’ll make low monthly payments with no money upfront. What’s the best payment option for me? Upfront Payment Monthly Cost Do I own the system? What happens if I want to sell my home and I have an ongoing solar panel lease? If you move, we will help transfer your solar power system’s contract to the new owners. Our team takes care of everything while you focus on transitioning into your new home. It has never been easier to make the switch to solar power with Symtech Solar.